BATON ROUGE, La. -- No, you don't need to adjust your television sets. That really is what South Carolina is wearing tonight. With some guidance from Under Armour, the Gamecocks are wearing their camouflage uniforms. They certainly are "different." This isn't the first time South Carolina has switched it up with the uniforms. The Gamecocks partnered with the Wounded Warrior Project, which aids injured armed services members and their families, the past two years and wore camo/military-themed uniforms uniforms for a couple of games. There are also some celebrities in the house. Pro golfer Dustin Johnson, who is from Columbia, S.C., is here decked out in Gamecocks gear, while Floyd "Money" Mayweather is hanging out with rapper 50 Cent. 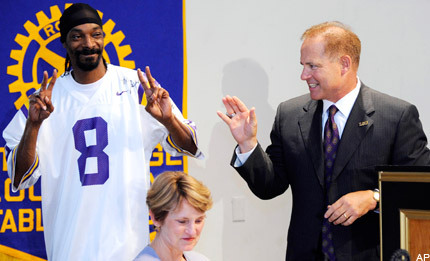 No word of Les Miles' old pal Snoop Dogg made it in. This place is full of yellow, and the fans have been particularly fired up all day. This is a big game for LSU, and the Tigers' backs are against the wall. LSU hasn't loss back-to-back games since 2008, and a loss tonight would likely all but end its chances at returning to the SEC championship game. The Tigers know what's at stake and they are ready to stop South Carolina's momentum. It's getting darker and darker around the stadium, and fans are getting louder and louder. I feel sorry for everyone who couldn't make it into this place tonight.